Product Registration Cards Can Save Lives! Product registration cards are required to be included in many categories of children's products such as cribs, car seats, and strollers. The contact information you provide to manufacturers on these cards can only be used to contact you should a need arise. They cannot be used for marketing purposes! One of the most common questions I get as a professional babyproofer is about installing stair gates. Once the excitement of a child starting to crawl passes, the dread starts to set in: we need to babyproof the house! The first place most parents look is to the stairs. 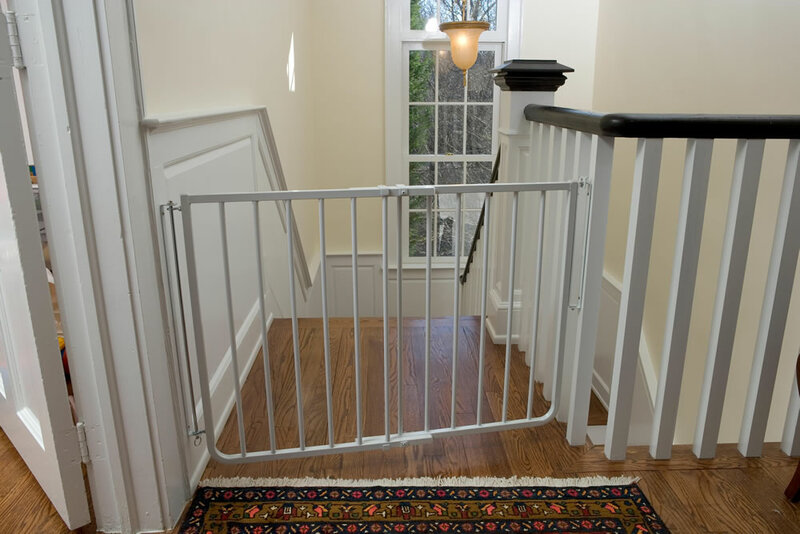 The danger of a child crawling to the top of the stairs unnoticed and tumbling down is obvious, but properly installing a stair gate can seem difficult. Many parents put it off or call me for help. As part of my in-home evaluations I will spend a lot of time looking at your staircase to determine the best gate options. If you would rather do-it-yourself here are some things to think about. The next thing you need to know before purchasing a gate is how wide your stair opening is. Most gates have some way of adjusting for width to fit the average staircase, but if your staircase is especially wide you may need to purchase an extension kit. Measure from wall to wall and look for a gate designed to fit that width or one that has extensions available. There are two main types of gates available: hardware-mounted and pressure-mounted. Hardware-mounted gates attach to the wall using screws and are normally the most secure way of mounting a gate. Pressure-mounted work by applying pressure in an outwards direction on both sides, squeezing the gate between two walls. Pressure-mounted gate used in a doorway. I prefer to only use pressure-mount gates in doorways, never on the stairs. Knowing the two main types of gates, you next need to consider where the gate will be placed. 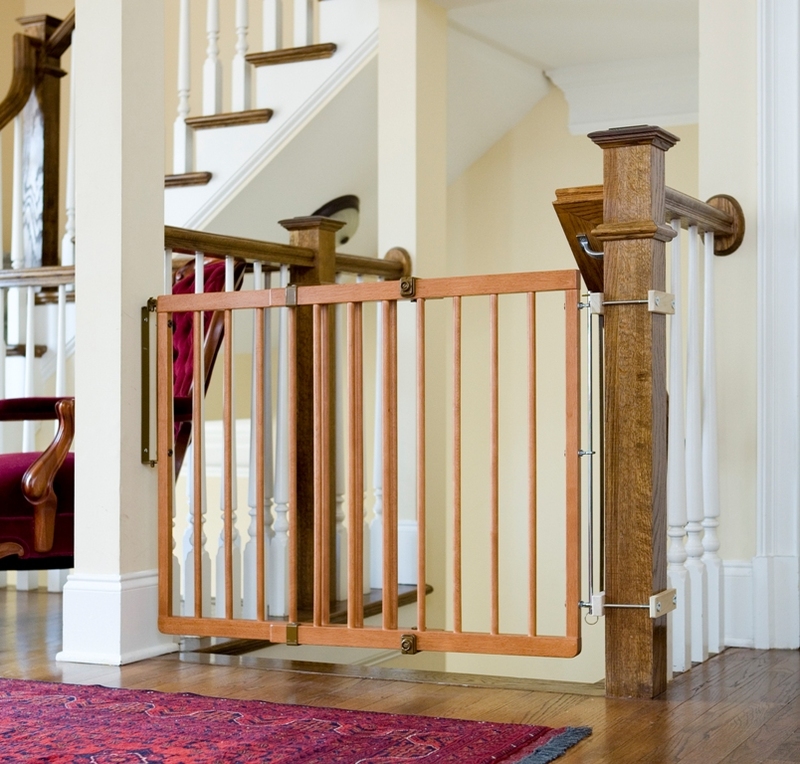 Pressure-mounted gates should never be used at the top of a staircase because they tend to loosen over time as they are opened and closed, and the pressure holding them in place will decrease. A child could then push, pull, or shake the gate, causing it to dislodge and tumble down the steps taking the child with it and possibly causing serious injury. The other main reason not to use pressure-mounted gates at the top of stairs is that many of them have a metal bar that runs across the floor to connect the two sides of the gate. This bar is usually about an inch in height, just enough to catch your foot as you step over it causing you (and your child if they are in your arms) to fall down the stairs. Because of these two main reasons, I will never install a pressure-mounted gate at the top of the stairs. Unfortunately while the JPMA recommends not using pressure-mounted gates at the tops of stairs, their guidelines for gate manufacturer members do not outlaw it, and so some JPMA-approved gates will advertise that they are for top-of-stair use. So where can you safely install a pressure-mounted gate? The bottom of a staircase is OK as long as it’s placed at the ground level or no higher than the first step, but I still prefer using a hardware-mounted gate as much as possible. The best place to use pressure-mounted gates is in doorways to either contain a child in a room or keep them out of a room. Lastly, never use an accordion-style gate or one with V-shaped or diamond-shaped openings. There have been several recalls on this style of gate due to the risk of a baby getting their head entrapped in these openings. In addition, older children have been able to use these openings as a foot- or handhold to climb up and over the gate. So now you know you should always use a hardware-mounted gate that screws into a strong surface for the top of a staircase. In most homes this means you need to locate a wood stud behind the drywall. In a perfect world you will have two studs located directly across from each other to mount into, but that’s not usually the case. So then what do you do? Many of the better gate manufacturers offer gates that can mount on an angle allowing you to have the hinge side and the latch sides offset by several inches and still work properly. Just be careful that when installing on an angle you don’t allow the gate to overhang the steps at all, leaving a gap that the child could get under. But what do you do if you have a wooden baluster instead of drywall on one or both sides? Well, sometimes this can actually be easier than installing into drywall, as you don’t need to locate the studs. Assuming the baluster is sturdy, you can often drill directly into the flat surface at the top and bottom of the baluster and hang the gate from that. But many people don’t want to damage their baluster by drilling holes in it, or perhaps the area where a bracket needs to mount is rounded. You can buy special kits that clamp around the banister, to which you then attach the gate brackets. The nice thing about using these kits is that while they can add cost to the installation, in a few years when you take them down there is no damage left behind to fix! The last thing to think about when installing the gate is, which direction do you want it to open? Gates always need to swing away from the staircase, never into the stairwell, but you can usually choose whether the hinge is on the right or left side. I always try to have them open with the flow of traffic. For example if going up the stairs you always turn to the right when reaching the top, then you would want the hinge on the left side. One final bit of advice for after you have installed the gate: Use it properly. Never climb over the gate rather than opening it to go through. For one thing, you may catch your foot trying to do this, leading to serious injury to you or your child if they are in your arms. Secondly, your child watches everything you do; by climbing over a gate, you are teaching them that is an appropriate use. They may try to climb over it themselves one day. If you are still unsure about the best child safety gate for your situation or would rather have an expert help you with the installation please give me a call at 404-333-1083. I’m always happy to offer advice over the phone! The adaptors being recalled. Note on the top non-recalled adaptor the 6 holes are solid. Hazard: The car seat adaptor support bars can fail, posing a fall hazard to children. Description: The car seat adaptors come in three models and are used to secure a variety of infant car seats onto Baby Jogger strollers. The “Single” model fits all single strollers, the “Double” works only on double strollers and the “Select/Versa” fits Select and Versa strollers. The car seat adaptors consist of two U-shaped, black, aluminum support bars and two black plastic adaptors that allow the support bars to attach onto the stroller. Black nylon straps secure the car seat to the adaptor on the stroller. The black support bars are labeled A and B. The A support bar is the larger of the two U-shaped bars and has a red plastic tip with 10 holes. Remedy: Consumers should immediately stop using their car seat adaptor and contact Baby Jogger for free replacement support bars. 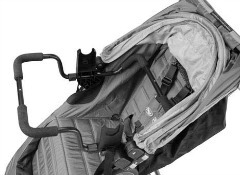 Consumer Contact: Baby Jogger® toll-free at (877) 506-2213 from 8:30 a.m. to 5:30 p.m. ET Monday through Friday or online at www.babyjogger.com and click on Recall Information tab at the bottom of the page for more information, or email recall@babyjogger.com.